SmartCharge® 2.0 is a customer facing billing system, in use at over 300 of customer sites in North America, Great Britain, and Europe. 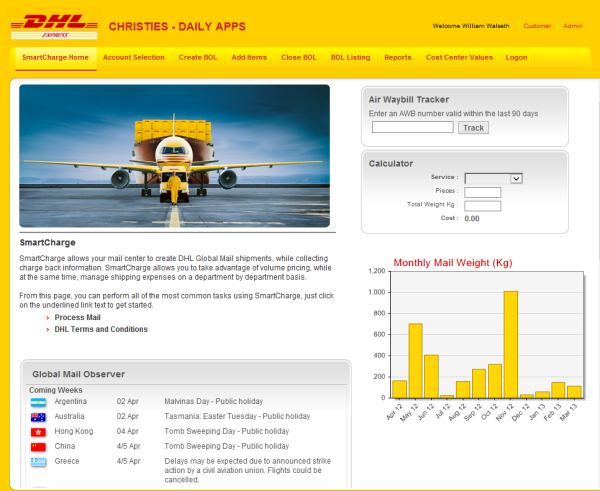 The application allows DHL customers to immediately calculate mailing costs, distribute mail costs among internal departments or external customers. The software integrates directly with internal mail processing and accounting systems. While meeting DHL GlobalMail’s demanding requirements for the software itself, our team designed SmartCharge® 2.0 with integration in mind. As a result, DHL was ready to work in a more connected way with their customers. With SmartCharge, not only can they automate or eliminate data entry, they can also share cost reporting throughout their enterprise, or customer base. For example one customer uses the end-of-day “send mail” event. Their customization extracts the mail data, prepares a proprietary mainframe file using XSLT, and sends the file via FTP the results to their mainframe. The events can access any web service, windows API, database or COM object in the enterprise. This feature allows DHL GlobalMail to provide valuable data integration to their customers, while at the same time keeping maintenance and testing costs low with a single version of the software. SmartCharge® 2.0 provides DHL GlobalMail operations notifications of pickups. This is new feature eliminates the need for customers to call for pickup, and allows operations to stay in touch with customers needs. The SmartCharge® 2.0 architecture is based upon HTML Applications (HTA), which allows Internet Explorer to store data locally, and access electronic scales through the serial ports. By using HTA, SmartCharge can run with or without an internet connection. All application data is stored in XML files, and is presented to users with DHTML and XSLT. The application is automatically updated with ActiveUser™ technology, Walseth Consulting Group, Inc. proprietary software distribution mechanism. ActiveUser™ makes the management of remote software installations as easy to manage as web-based applications.